How to Get a Stomach Tattoo. The stomach is another one of those areas you need to think about carefully before deciding on a tattoo. There are several factors to consider and it's sometimes a little more difficult to find a willing tattoo artist. However, after weighing the pros and cons and finding the right design and placement, tattoos on the stomach can be very striking. Choose a design. People choose a variety of things for their stomach tattoos and you tend to have a fairly large area to work with, so you're not too limited on design choices. A common idea for stomach tattoos, mostly for men, is a word usually in Old English that is arched across the stomach just above the belly button. For women, sometimes a small design on each side of their lower stomach such as nautical or other type stars, swallows or other birds and flowers or hearts. Decide on placement. This is an important step, especially for younger women who've not yet had children but plan to do so in the future. 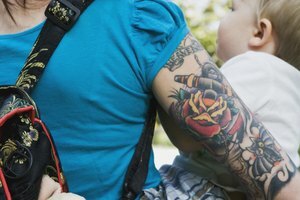 Tattoos can adjust to gradual weight fluctuations generally without much distortion or damage; however, pregnancy can cause rapid weight gain and stretch marks that can greatly affect your design. Think about risks of distortion over time. This goes hand in hand with deciding on placement. If you're getting an intricate design directly below your belly button, there's a big risk the tattoo will change as you age, put on weight or lose muscle mass. Factor in pain. The stomach ranks right up there with rib cages in that it's one of the most painful spots to get a tattoo. There's not a lot of solid backing to help hold the skin down and in the case of larger people, it's really hard to get a good stretch on the skin, so the tattoo procedure tends to be more uncomfortable. Find a willing tattoo artist. Although most tattoo artists are willing to do stomach tattoos, they may warn about the things discussed above. There are some, however, they won't do stomach tattoos because the area can be difficult to work with, especially those who already posses a fair amount of belly fat and/or stretch marks or loose skin from previous pregnancies. Take breaks or do it in separate sessions. Once you've got your design, placement and a willing and competent tattoo artist, you'll have a good idea of how long the tattoo is going to take. Keep in mind stomach tattoos are considered very painful, so don't be shy about asking for breaks if you need them. Don't be surprised if you feel a little nauseous while you're getting your stomach tattooed. Some people find that taking a couple of antacids prior to the procedure helps keep their stomach calmer. Suddenly developing a beer gut, just like a distended belly during pregnancy, can have the same negative effects on a stomach tattoo. 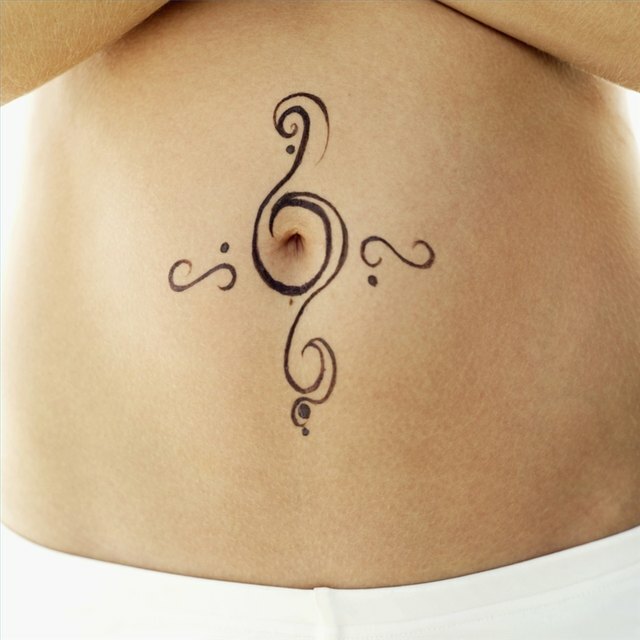 Rapid weight loss can also cause undesired results in a stomach tattoo. If you're having any kind of abdominal surgery in the near future, wait to get a stomach tattoo until after the surgery, after you're fully healed and after you know you won't be requiring any further surgery any time soon. If you've had any kind of abdominal surgery recently, be sure you're fully healed before contemplating a stomach tattoo.